Last bit of my High Performance Learning Environment was configuring System Center Operation Manager (SCOM). At least I installed operation manager and in my menubar I have operation manager and access to command shell, operation console and web console. Screen shot of web console can be seen below. In setup of SCOM you can find installation documentation, it also tells you how to deploy SCOM on a single computer using setup wizard. And that is what I have done, but I have configured SCOM to do something like monitoring BizTalk. 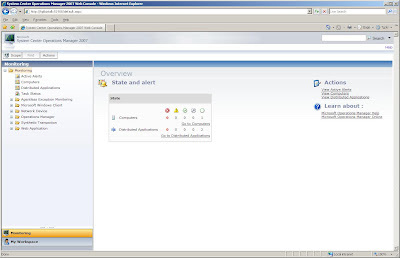 So next step is getting the BizTalk Management Pack for SCOM, see also my previous post about BizTalk and SCOM. I installed management pack, which seem to go smoothly and then I imported the pack inside SCOM. Through application console inside administration you can import management pack. You will have to import Microsoft.BizTalk.Server.2006.Library 6.0.6278.16 and Microsoft.BizTalk.Server.2006.Discovery 6.0.6278.16 first, because BizTalk Monitoring Management Pack depends on it. That is you have to start with the library, then discovery and finally monitoring. Next step is creating a new management group through authoring inside SCOM console. You need this, before you can install agent that is going to do monitoring. To install an agent I need to specify management group information (specify manually the Management Group for which this agent will monitor). I specified the group created before in SCOM console under authoring. Once installed I still did not see any monitoring going on and I then found out that Health Service was not running. Error: The Health Service could not log on the RunAs account HPL\SQLServerInstance for management group HPL Admins because it has not been granted the 'Log On Locally' right. I corrected the error by assigning proper rights for the account. For monitoring I added a monitor through Authoring Pane, monitors create new monitor (unit monitor). Then selected type of monitor : Windows Services - Basic Service Monitor. Next gave it an name and selected through select BizTalk Group and then clicked create. Through Monitoring pane I inside BizTalk Server 2006 (due to management pack is there now) ---> Core ---> BizTalk 2006 State View is show BizTalk is Healthy. I hope this post is useful for you to configure SCOM to monitor BizTalk, at least a part of it. I do know if I did configuration steps in the right order, but I have got it working so far.